History, as they say, is written by the winners. The War of the Ring (as depicted in the three volumes of the Lord of the Rings) is written from the perspective of the Free Peoples of Middle Earth, and documents their struggle to overthrow a ruthless satanic-like ruler, Sauron, who represents all that is evil in the world. According to the Russian paleontologist/ biologist/ fiction writer Kirill Eskov this was a bunch of romanticized propaganda from the side of the winners. 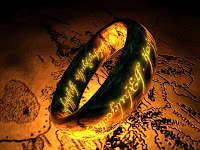 In his novel The Last Ring-Bearer he tells the story of the War of the Ring and what happened after that from the perspective of the losers, Mordor. The characters of the original Tolkien Trilogy are getting a complete makeover. Gandalf is depicted as a warmonger who wants to destroy the technological marvels of Saruman and Sauron and keep people uneducated and easily manipulated with his fundamentalist ancient witchcraft. Aragorn is a Machiavellian scheming ruler who is a puppet of his Elven wife Arwen. Mordor is depicted as a land of science, philosophy, free thinking and art that places its trust in reason and not ancient religions. The protagonist is a field medic from the southern lands who is assisted by an orc scout and their task is to destroy an elven magical mirror in the land of Lorien before its ancient magic is used further. After the war is lost the remnants of the Mordor civilization is struggling to fight back and keep its roots to reason and science. The novel was published in Russia and Poland to great success but, not surprisingly, it never saw a publication in the western world. I am sure that the Tolkien foundation would never approve it and they would be sued and tossed to Mount Doom. Fortunately for us it was translated and is now available as a free download. Since there are no profits involved they cannot be sued as any other fan-fiction story cannot.